Wait, stop. Is this Yet Another Data::Dumper? Well, yes and no. Data::Dumper (and friends) are meant to stringify data structures in a way that makes them still suitable for being eval'ed back in. That's really awesome, but poses a huge constraint over pretty-printers. Earlier this year, brian d foy talked about the amazing powers of Data::Dump, but it still suffers from those constraints. Same goes for the (also great) Data::Dump::Streamer. First thing you'll notice is the colored output, indexed arrays and a little extra regex information. But Data::Printer offers much more than that. How about debugging objects? And what if your data is attached to others? The idea behind Data::Printer is that most developers (at least to my experience) use such tools mostly just to see what's going on inside their variables and objects, not to serialize data in and out of Perl. So I decided to make a module that would focus on that: display Perl variables and objects on screen, properly formatted (to be inspected by a human). Data::Printer is somewhat similar to Ruby's "awesome_print", but I made sure to include more customization options and some neat features present in Perl's data dumpers. Dumper( %foo );  # there, problem solved! Data::Printer comes with (I hope!) very sane defaults, so usually all you have to do is "use Data::Printer" (or even shorter: "use DDP") and start peeking at data structures with the exported "p()" function. But pretty is a matter of personal taste, and from colors to array indexes to the hash separator and their default values, you can customize just about anything! Sounds neat, but I'm not gonna type all that every time! 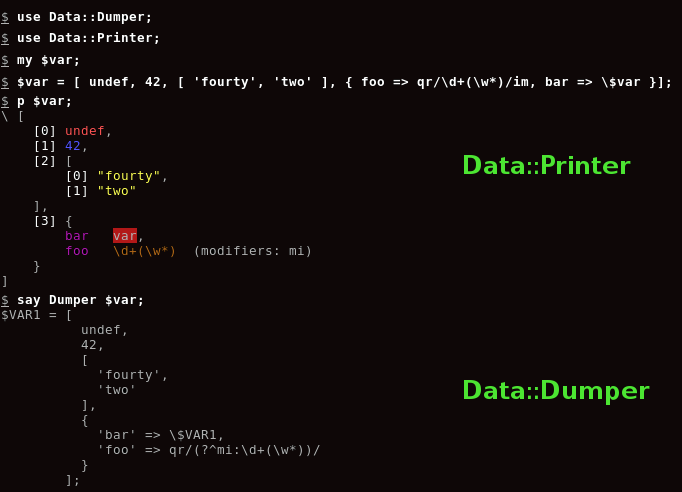 You can also make your classes Data::Printer-aware simply by adding a _data_printer() function to them. You don't have to add Data::Printer as a dependency at all, and it will use that function to filter your class by default instead of doing a regular dump. If you want to serialize/store/restore Perl data structures, this module will NOT help you, and you should try other solutions such as the Dumper/Dump family, Storable, JSON, or whatever you can find on CPAN. Code is on github. Comments, feature requests, bug reports and patches are welcome! Most excellent, I was using Data::Dump, but I felt a need for something better, specially when dumping DBIx::Class objects. Your filter system seems to be exactly what I'm looking for. I'm impressed with the insight here that pretty printers are used mainly for data structure exploration, not serialization. Well done! Data::Dumper with DateTime objects and such is horrid, I love the idea of a filter on those really huge objects, and prettier pretty printing is great to begin with. I foresee this module getting plenty of use. @melo - thanks! As mentioned, there's the beginning of a DBIC filter via the DB standalone filter. It currently displays connection details on Schemas, and SQL queries on ResultSets. If you get to improve this in any way for general purposes, drop me a pull request - and remember to add your name on the contributors list! @doherty - thanks, I hope it gets a lot of use too :) As for DateTime, I agree with you so badly I even considered making the DateTime filter on by default as it's been really useful to me, but it didn't seem fair to do it without other people's input on this (and besides, one can always add it to the .dataprinter file). Please let me know if there's anything I can do to make the Data::Printer experience even better! Can it also print the name of the variable being printed? Does it also work on Windows? Wait, half of CPAN for Module::Build? It should be core, no? I didn't know you had to download it, I'll see what I can do to make the installation experience more pleasant. Right now the "caller_message" option can't print the name of the variable, only line number, package name and file name. I'm looking into PadWalker and Devel::ArgNames for that, patches are welcome! Well... if you're not stuck on 5.8.x, it's core. I'll have to try it, then! I notice your implementation directly applies colours, using Term::ANSIColor. Just a thought, but I wonder if you'd consider splitting the implementation out a little bit, by building a string in the abstract using perhaps a String::Tagged object to store string content with formatting. This can then be rendered to a console using Term::ANSIColor as in your current code, but could also be rendered to HTML using String::Tagged::HTML, or to any number of other output representations as yet to be defined. Very, very dumb question... How do you use Perl in "shell mode"? 2) I'd like to say `p my $foo = Foo->new` during the development to get a quick dump, but it just doesn't compile because of the prototype, which is a bit disappointing. It does have some massive preqs which prevent it from being installed in our moldy old production perl though. @curtis - please do, and let me know what you think! @miyagawa (1) - I actually named it 'p' as a homage to the perl debugger's version :) The shell above is not the debugger, it's just Devel::REPL. I tried it the same way as Dotan above and got the right output. If you were talking about something else, please let me know so I can try to fix it in future versions! What a great post with nice details. I really appreciate your work. Can i print plastic business cards by any laser printer? I'm impressed with the insight here that pretty printers are used mainly for data structure exploration, not serialization. Well done! No more worries for printing or printer issues due to keen services of printer cartridges specialist i am able to print huge amount on daily basis without any problem. Nice and interesting article thanks for sharing the information..